Pinterest has evolved during the past few years from a trending social network to a powerful visual search engine, and as with any other search engine, you can optimise your presence to be discovered by other users. With more than 100 million users who keep searching and pinning new content depending on their interests, Pinterest is probably an underrated platform, when it comes to its searching capability and the traffic it can drive to your site. However, in order to create a successful profile on Pinterest, you need to make sure that your pins are easily discovered from other users and that’s when SEO optimisation for Pinterest is required. Yes, there is SEO optimisation for Pinterest and it’s not as complex as it sounds. Pinterest is not about quick return-on-investment, and you may be surprised about its evergreen value, so it’s time to start optimising your presence and help other Pinterest users discover your pins through searching. Before you even start pinning, you can tweak your profile and pick the right username. You can change it through your settings and use one that reflects your presence and the way you want to be discovered. The URL will serve as your keyword, so make sure you pick a clear, direct and memorable username. This also applies to your actual profile name, as it will serve as your identity on the platform. Your boards should be appealing and neatly organised, emphasising both on the titles, but also on the images of the boards. Adore Me decided to create an interesting Pinterest presence by paying attention to the details, being playful both with the titles and the images. From an SEO perspective, it is important to think like a user when picking a board’s title and name it the way it would be searched. Yes, a clever and funny title is great, but if you want to improve your pins’ ranking, you need to optimise the titles in a way that they can be discovered by other users. Still, you don’t have to strictly focus on the use of keywords, feel free to mix creativity with effectiveness. Nordstrom, for example, has a very successful presence on Pinterest, and heavily relied on the right optimisation to measure significant traffic from its pins. Every pin is the representation of your profile, which means that you need to optimise it as much as possible. Don’t be afraid to be descriptive, as this will help the search engine to discover your pins. Pinterest favours the pins that provide a specific and thoughtful description, one that helps the users find the image they are looking for when performing a search. Add all the details that describe your image and create a natural flow of text that will favor your pin’s discovery towards others. On a ‘hashtagging’ scale from Facebook to Instagram, Pinterest is probably in between, as hashtags are not completely useless, but they are also not necessary to extend the reach of your pins. The best way to find the right keywords for your pins is to actually perform extended searches on your own. Try out how Pinterest searching works, which results show up first, how Pinterest organises the pins, the boards and the pinners in order to start understanding the platform at a deeper level. Which keywords does the automatic suggestion bring together? 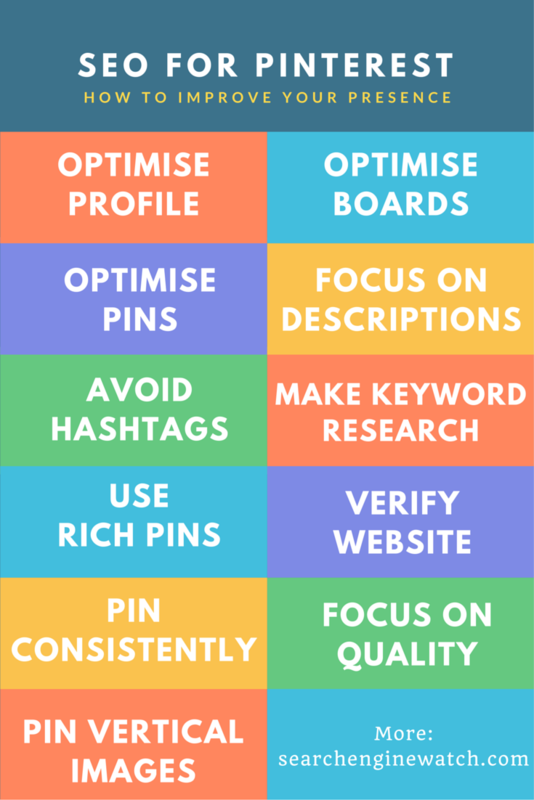 Which keywords are relevant to your pins? Except for the desktop search, it might be a good idea to try out Pinterest’s mobile version, as there’s an increasing number of the audience using mobile searching for the sake of convenience. As more than 75% of Pinterest usage takes places on phones and tablets, it’s important to understand the differences between the desktop and the mobile search, with Pinterest trying to make the mobile platform as functional as possible. This way you can analyse the most popular pins according to their search ranking and use the results to improve the optimisation of your own keywords. This is an easy way to understand what Pinterest users like pinning from your own content, but also the way it ranks in Pinterest’s platform. Pinterest is among the social networks that may drive great referral traffic to your site, so it’s useful to measure the pages that attracted the biggest traffic, examining how pinners reached your page and whether you can further optimise the most popular pins, or even to upgrade your content with new posts. Rich pins are the enhanced version of the regular pins, providing more information about a pin. They can be used in six contexts (app, movie, recipe, article, product and place) and their effectiveness is significantly better than usual pins. Whether it’s providing the price of the product, a full-recipe, or an article, rich pins tend to perform better in the search ranking and they are highly recommended if your presence can benefit from them. For example, About.com noted an increase of 70% on its traffic back to the site with the use of rich pins. A verified website seems to be prioritised on the search results above the rest, increasing the pinner’s authority and eventually the ranking on the searches. What’s more, the verification of your website on Pinterest allows you to access further details on your account in Pinterest Analytics, helping you understand the performance of your presence, from your most popular pins, to an analysis of your audience. Pinterest is all about consistency. You don’t have to be obsessed with it, or look like a spam account, but you need to incorporate it in your content calendar and pin appealing content several times during the week. What’s more, content curation is also important, which means that except for the content creation, you also need to spend the necessary amount of time to spot popular pins and users in your niche area, in order to repin what’s relevant to your audience (and the boards you want to create). Remember, Pinterest is ideal for the circulation of evergreen content and this highlights even more the need to focus on relevance and quality. Every image you’re pinning should aim to stand out from the rest, always while maintaining its relevance. Quality is rewarded with better ranking in the search results and thus, with repins and traffic to your site. Pinterest users may not notice your description, but they certainly pay attention to the image and this means that every pin should be clear, have the right size (ideally at least 600 pixels wide), and balance the actual image with text overlays if needed to provide more context..
Every image can be pinned on Pinterest, but vertical images have more chances to be noticed, as they occupy more space in the feed. What’s more, vertical pins are ideal for mobile devices, which brings us back to the importance of creating pins that are highly optimised for Pinterest’s mobile version.